Here’s Your TBYL Bonus #3! Click image to view and download. 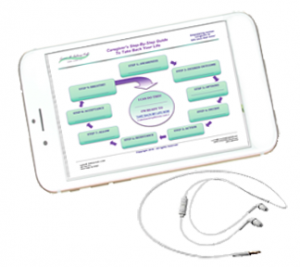 This printable “roadmap” of the self-inquiry Q&A process Loren walks you through in the audio is the perfect companion to the recording. It has space for you to write in your unique answers to the 9 questions she’ll ask you as you go through the process. 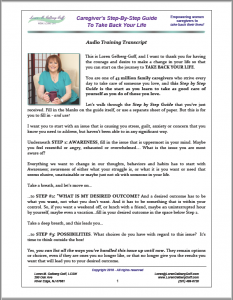 Print out a new copy each time you are dealing with an issue that has you stuck or upset. You’ll continue to learn and grow every time you use it! In this 14-minute recording, Loren walks you through the 9 steps to getting from a state of feeling stressed, overwhelmed or upset to one where you are in charge of your emotions, feeling more peaceful and clear-headed, and allowing your natural problem-solving creativity to identify actions you can take to get the kind of life experience as well as the practical results you really want! This pdf transcript of the audio is great for those who prefer reading to listening. As a bonus, if you’ve never had a private consultation with Loren, use the link on the last page to schedule a complimentary 1-on-1 call – her gift to help you get your life back even faster! 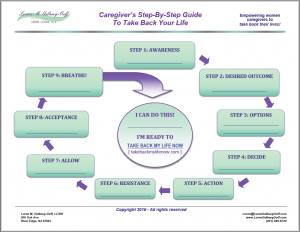 Enjoy the training – and be sure to use the Step-By-Step Guide any time you hit a roadblock on your caregiving journey!